At the heart of Astrid Klein’s work is a reflection on mechanisms of representation, (visual) stereotypes and power structures that guide and determine both our perception and our thinking. She combines existing visual material with equally important text fragments drawn from an in-depth examination of philosophical, aesthetic and scientific theories. Klein’s continuous re-arrangement, transformation and filtering of image and text elements gives rise to complex compositions that cannot be tied to any one, unequivocal statement. On the contrary, it is the viewer’s responsibility to find meanings and create semantic links within the works. They are provocative at the content level but not only; formally the works also testify to the artist’s enormous mastery of materials. Time and again, she questions the possibilities and limits of various artistic formats, whereby the potential of painting plays a particularly important role in her considerations. The artist’s current exhibition at Sprüth Magers centres on a presentation of the CUTs (1986/1996) group of works. These collage pieces were first shown in 2018 as part of Klein’s major retrospective at the Falckenberg Collection in Deichtorhallen Hamburg-Harburg. 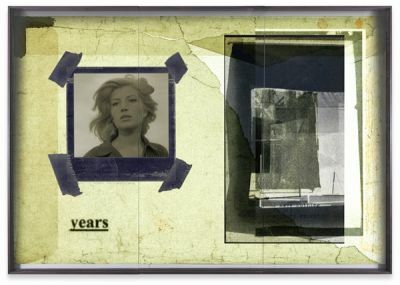 Astrid Klein was one of the first artists to work with large-format slides; placing photographic and text elements in dialogue with one another in her typically rhetorical style. Her imagery derives first and foremost from an inventory of pictures that recalls a collective visual memory. By intervening in the existing pictorial material, changing and rearranging it, the artist addresses both regimes of the gaze and visual structures as well as specific mechanisms of representation. In contrast to her famous collages of the 1970s, the CUTs also place a certain amount of importance on the images’ spatial dimension. Astrid Klein uses transparent film as the support material for her collages, the translucent surface texture of which allows traces of the artistic working process to become visible. Still, the synthesis of light and material reveals more than just how the works are put together; it also appears to dissolve the two-dimensional character of the images, giving them more of a sculptural character. The size of the works also makes it possible for the viewer to see the collages from different perspectives depending on where they are standing. The collages are accompanied by a selection of the artist’s early drawings on display in the small exhibition room. These drawings, which have only rarely been presented to the public, are crucially important for Astrid Klein’s oeuvre and already attest to her pronounced interest in the collage technique. In arranging different materials together and mounting the drawing paper on aluminium foil, for example, or covering its surface with transparent paper, she creates different layers that expand the pictorial space. The layering process is a conscious formal decision by the artist that is further reflected in the messages conveyed within each work. Klein combines drawings, fragments of ideas, and literary and philosophical references on the paper’s surface, opening up spaces of thought in which political, theoretical and aesthetic considerations are placed in dialogue with one another. Finally, the early drawings are accompanied by the neon work memory overflow (1998/2012). Neon light has played an important role in Klein’s works since the 1980s. The artist develops sculptural light forms on the basis of drawings, in which the investigation of physical spaces becomes increasingly important vis-à-vis the questioning of pictorial spaces. In memory overflow, filigree neon tubes combine to form an intricate body of light whose structure is extended by a light bulb. Attached to a cable, it hangs down to just above the ground, its warm light striking a clear contrast to the cool neon light. At the same time, the surface of the complex light body becomes the carrier material for text fragments. With this reciprocal interplay of text and light, the artist broaches the spatial character of the material as a subject matter while simultaneously encouraging viewers to question their usual habits of perception. This exhibition of Astrid Klein’s work at Sprüth Magers presents contrasting works which, despite their dialogical differences, form an intellectual relationship through both formal orientation and content. With her work she casts an organising look at the present in which she finds herself, reflecting not only on physical, psychological and cultural spaces, but also on the various parameters that determine how knowledge is formed and how it is gained. Astrid Klein (*1951 in Cologne) lives and works in Cologne. She has received numerous awards for her work, including the Käthe Kollwitz Prize endowed by the Academy of the Arts, Berlin (1997) and the KUNSTKÖLN-PREIS (now known as the Cologne Fine Art & Antiques Art Prize) in 2001. Her work has been the subject of many institutional solo exhibitions, including those at the Falckenberg Collection at Deichtorhallen, Hamburg Harburg (2018); The Renaissance Society, Chicago (2017); KW Institut for Contemporary Art, Berlin (2005); Contemporary Art Center, Vilnius (2003); Hamburger Bahnhof, Berlin (2002); Neuen Museum, Staatliches Museum für Kunst und Design, Nürnberg (2001); Kunsthalle Bielefeld (1989), travelling exhibition by the Kestnergesellschaft, Hannover; ICA, London; Vienna Secession and Forum Stadtpark, Graz (1989), and the Museum of Contemporary Art in Seoul (1981). She has also participated in important group exhibitions, including those at the Kunsthalle Düsseldorf (2016); Deichtorhallen Hamburg (2015); Städtische Galerie Karlsruhe (2013); Weserburg Bremen (2011); Pinakothek der Moderne, Munich; KW Institut for Contemporary Art, Berlin (2005); The artist also took part in documenta 8 (1987) and the 42nd Venice Biennale (1986).